By @SimonCocking. 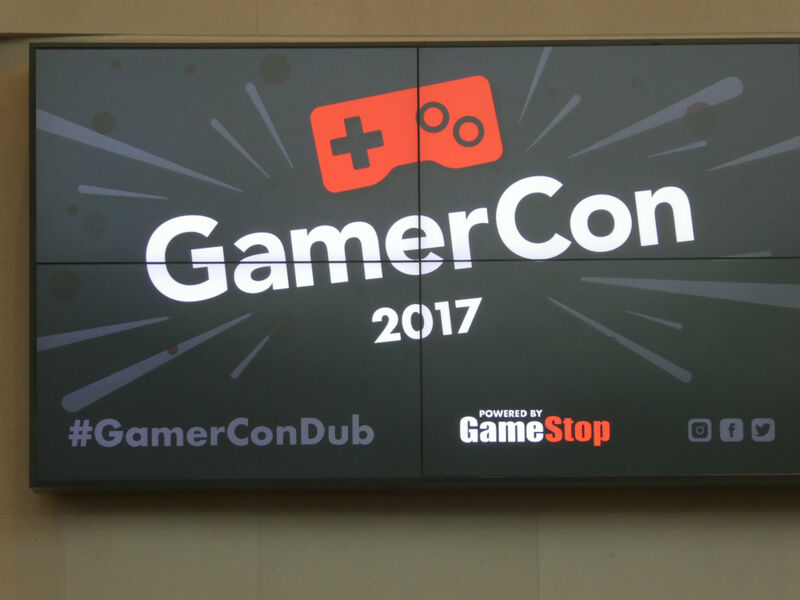 This St Patrick’s weekend saw the first #GamerCon take place at the National Conference Centre. With queues snaking several blocks away the building, and 25,000 tickets apparently sold beforehand for an event with a daily capacity of 7,000, this event has generated a lot of online discussion and comments. Firstly the positives. People came, tickets sold out, there was clearly an enthusiasm for events like this. Following the hashtag twitter feed in the morning there were lots of excited tweets by kids and parents, many travelling from all over the country, Cork, Donegal and more to attend. Inside, even by early morning the space was filling up with lots of excited people. The Cosplay attendees looked great, and there were lots of cool costumes, and they were all happy and willing to pose with regular punters. There were some good speakers, and we had an insightful and articulate conversation with Ali A and his a-list gaming partner about the challenges, and excitement of running a successful youtube channel. He was also considerate in answering the questions from someone who could have been no more than eight years old too. On the second floor the e-play initially started well, with many many terminals for many many gamers. Then though, even by midday on the Saturday, the space began to fill, and fill. As someone who has attended football matches as a child when you are swept off your feet, this is how the downstairs began to feel. My own 9 year old carefully held onto my hand, but the space was already getting uncomfortable. The queues outside seemed to only be getting longer too. Once you then realise that for some, 3, 4 and 5 hours later they were still queuing outside, only to be told that there would be no final success of actually being allowed in, then you know that everything was not all right. Similarly too, when you start reading blog posts of people discussing that, rather than dealing with a proactive refunds policy, changes to the T&C’s were being made, seemingly to repudiate the statement that refunds were possible. Already eagle eyed researchers have pulled up cached versions of the T&C document from prior to the event and compared it to tweaked, updated versions. Similarly the event organiser, rather than address the concerns had seemingly deleted their twitter account. None of this bodes well for an event organisation looking to do the right thing by those who bought their tickets and queued in good faith. Overall, looking at the big picture you can see here, as with previous Minecraft events too, there is a large and keen interest in Gaming related events in Ireland. Also, if 25,000 tickets can be sold, then there is an opportunity here, but not at the expense of those paying and not even getting admission. A number of posts by volunteers also suggests that while money was received in terms of ticket sales, the management of the volunteers left a lot to be desired. Thankfully the large crowd sizes did not result in any injuries, but there still needs to be more done to make sure that outcomes of this event are properly and ethically dealt with in the right way.